The 90's introduced a slew of dynamic hip-hop duo's including Das EFX, Cella Dwellas and Mos Def & Talib Kweli. I.G. Off & Hazadous were one of these duos and put their name on the map in that era with several indie releases and countless underground radio sessions as a New York rap group known for their gritty raw street grammar and dope freestyle skills. The Bronx/Queens duo first appeared on the DJ Spinna produced and released 3-track 12" "Street Serenade" in 1997 and were featured on the classic Rawkus Lyricist Lounge Volume One compilation on the posse freestyle cut "Bathroom Cypher" in 1998. Within the next few years I.G. 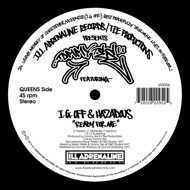 Off &Hazadous recorded a string of singles, working with DJ Spinna again on the "The Nicest"12" single, and getting a placement on the Superrappin Vol. II album. Around that time the duo also connected with Norway's finest producer and Guesswhyld Records affiliate Tommy Tee.